Simple visual diaper-cake-instructions should get your creative juices flowing. Learn how to make a baby-diaper-cake shower gift for the green Mom to-be. She will love it! And, what a wonderful gift idea this is, especially if this is an eco-friendly baby shower. If making a diaper-cake doesn't get your imagination going, I'm not sure what will. I can't tell you how many times I've gone blank for a unique gift idea for the new Mom. Everyone can (and most of us do) buy a bag of diapers and wrap them up the same old recognizable way. Hardly much of a surprise. And, as much as diapers are always needed and very much appreciated, almost seems kind of boring presented that same old way as a gift. Wouldn't you like to attempt to jazz up this gift in a unique and creative way? If so, follow the diaper-cake-instructions. 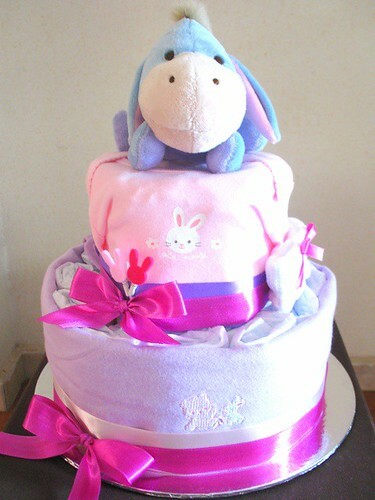 Diaper cake "recipes" online vary, but are generally easy to follow. Depending upon your ideas for the added touches and decorations, the supplies needed are generally consistent but the sky is the limit. This is what will make it so much fun to create. There are so many other categories from which to pick from when following diaper-cake-instructions. A cloth diaper cake is so perfect for the green baby shower. So are organic diaper cakes. In other words, any type diaper will work as you construct the tiers of your cake. Depending upon the design showing on the diaper itself, some instructors I've seen have shown 2 different ways of rolling up the diapers to get started. The result will either hide or purposely show the design in a circular continuous flow. A certain rolling up method will also leave the ends of the diapers kind of "loose and messy" looking. Since the tiers sit on each-other like a regular cake, it's helpful that these ends be as flat as possible for a more stable support. A blanket effect could help with this. As you build, you can decide whether your colors will be suited to making it a boy-diaper-cakeor a girl-diaper-cake. You may opt for pinks or blues when choosing a ribbon to wrap around the diaper cake that will hide the elastic bands you will use to bunch up the nappies in groups. You may just decorate your cake suited to boys or girls with the types of gift accessories you stuff in. Maybe your creation will be totally neutral. What kind of a theme diaper cake will you have? A seasonal theme? Holiday theme? Carton character theme? Your diaper-cake might follow an "animal" theme, or baby's first Christmas theme. A baby born during Easter Holidays? I'm sure your creative diaper cake will feature at least one Easter bunny. Are you a friend of Mom? Are you the Hostess for a baby shower? Watch the diaper-cake-instructions here and try this. Do a real cake AND a diaper cake. Either way, this cake can make a gorgeous centerpiece on the table where baby shower gifts are being gathered or presented as a gift later. Not only will this type of cake be a welcome addition to the baby shower (and I don't doubt there will be a REAL cake for the guests to eat), this gift has no wrapping. No wrapping, no packaging, no carbon-footprints, no waste! Everything used to make this cake will be reusable. There can still be useful surprises though, depending on how you decide to build your diaper-cake. Follow the diaper-cake-instructions, look at photos, and you will see there are lots of choices. The basics you will need are ALOT of diapers, rubber bands of different strengths and sizes, a base of some kind of support of the tiers, decorative ribbon, and thin wooden rods or bbq skewers to hold the tiers together. The rest will consist of what you decide you want exactly for accents and decorations. I've chosen this short video for you to watch to see how this is generally done. Don't be fooled by the simplicity. Remember, the bigger and more elaborate your baby-diaper-cake is, a little more skill and patience may be called for. As the tiers are formed, some people will leave a space in the middle. 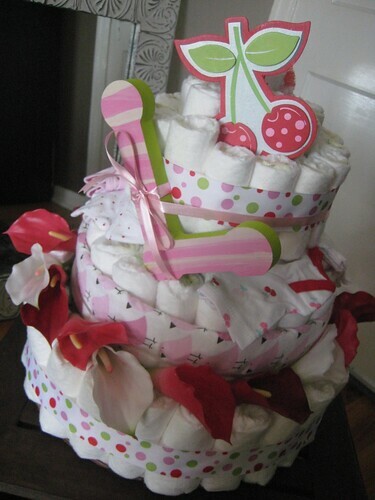 Instead of filling the whole tier with diapers, small gifts will be tucked in the middle spaces up the tiers instead. A baby bottle seems to be a good way to end at the top and this will hold the final smaller tier. This is where the surprises will be. Mostly they will be for the baby, but they can be for mom too. Pacifiers, creams, rattles, baby shampoos, wash cloths, Baby bath towels or small receiving blankets, teethers, soaps, lotions, hair accessories, baby socks and much more. Baby bottles and small stuffed animals are very popular as well. And most of these items also come in organic or eco-friendly materials of course! The greener the better. Don't forget your diaper-cake topper. Silk flowers, a stuffed toy, a pair of booties, whatever you like will look good. Most of the ones I've seen have a little stuffed animal on the top, that usually goes with the colors or the theme. Diaper-cake-instructions really follow no hard and fast rules. You can make a baby-diaper-cake as small or as big as you want. Your cake can be 3 tier or 5 tier. The bigger it is, the more diapers you will need to construct it, and the broader the base and the tiers might be. I've seen these creations for sale for as low as $30.00 up to as much as $200.00 Of course, the bigger and more elaborate the diaper-cake is from a retail resource, the more it will cost. Watch the diaper-cake-instructions video a few times to get the hang of it. Try one yourself and you are sure to be the hit of the baby shower with your own unique diaper-cake-creation. Have You Already Made One? Do you have a story or some tips to share about your diaper cake? Was it difficult or easy to do? Did "Mom-to-be" just love it? Whatever you would like to share is fine. Give Your Cake a Title - For Example: "Teddy Bear Diaper Cake"